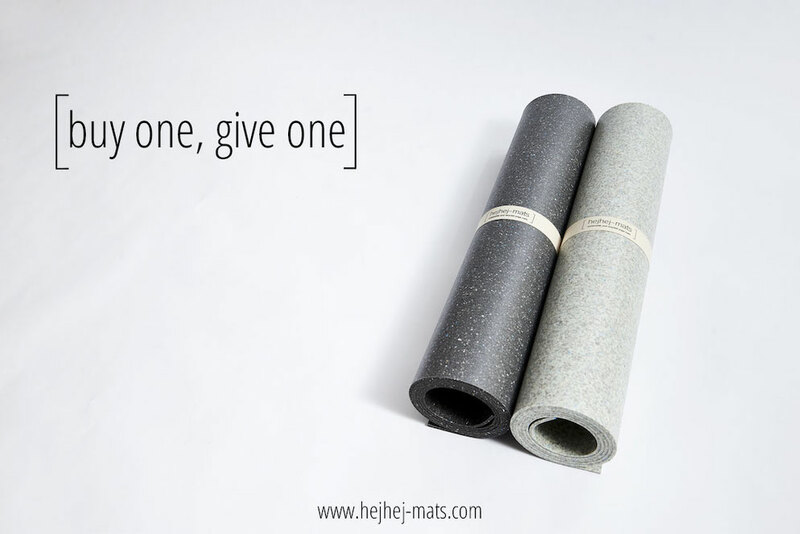 We want to use this blog article to inform you about our current social hejhej-special: from the 15th of April till the 15th of May, for every yoga mat bought we will donate one yoga mat to two social initiatives for people with a handicap. Read more about why social sustainability is so important for us, why we decided to do this social special and what these social initiatives are about. We have not started hejhej-mats for economic reasons. We believe that we all have to make our planet more sustainable and hejhej-mats is our contribution. We try to make this contribution as valuable as possible. For us, the environmental benefit is extremely important and basically is part of our product. Our yoga mats are made out of recycled materials and are again recyclable at the end of their lifespan. In this way, we are contributing to limit the amount of plastic waste on our planet. However, sustainability is not all about our environment but also about the social side. For this reason, we have built up the whole production of our hejhej-mats in Germany. We are donating 1€ of each hejhej-mat to the NGO Earth Child Project, an initiative offering yoga and environmental education to children living in the townships of South Africa. Our last donation was used to build up a safe yoga space, where the yoga lesson can take place in a peaceful and safe environment. We want to make our social impact even bigger! Supporting the wonderful NGO Earth Child project already makes us so happy. Anna has visited them in South Africa and we really see that our donated money and our cooperation is valuable and contributes to social sustainability. However, we now want to enlarge our social impact. Every once in awhile we will partner up with different social organisations. We are doing our first special right now and until the 15th of May: for every bought yoga mat during these 4 weeks, we will donate one to two initiatives for people with a handicap.The reason we chose the two workplaces for our first social special is a personal one. We are in really close contact with the two initiatives (WerkStadt Lebenshilfe Nürnberg) since at these two places our logos get sewed on top of our yoga mats and all the mats get packed, stored and shipped. The two workplaces are located in Nürnberg which makes it really convenient and easy for us to come by. We have already spent quite some period of time in both places and we enjoy every visit. The way they are sewing every logo on top of our recycled yoga mats is so precise, careful and just perfect – same with the packaging and shipping. With our social special we want to say thank you for the great cooperation we so far had and for all that will come in the future. What the WerkStadt Lebenshilfe Nürnberg is all about? People working there have different disabilities and problems to enter the normal labour market. The workplaces offer them special support and give them the chance of a so important regular work life where they have important tasks and are really needed. Maybe you are wondering why we are doing this social special and why we are donating so many mats. Our highest motivation is to change the world a little bit and to make it a little bit better and sustainable. We want to show you that social sustainability is really important and that we all need to see the bigger picture. For us going to work is normal, often we even complain. For many minority groups in our society, this is not normal nor easy. Thanks to social initiatives like WerkStadt Lebenshilfe Nürnberg these people can be part of our society. We think this is great and we are happy to donate some of our yoga mats for their sports and gymnastic classes and to thereby contribute to social sustainability. Let’s now spread the word! You can now buy your own fully sustainable yoga mat and at the same time give one mat to a social initiative. Please tell everyone about our social special in order to reach our goal of 50 donated mats. Thank you so much for showing the world that you care for social sustainability!